Yet another Catriona Shearer puzzle. Is more of this design green or blue (and by how much)? I was hoping I’d find a clever way to make the answer drop right out, but nope, I ended up mucking about with lengths of sides of similar triangles. Right triangles fortunately, and you don’t need any hypotenuses or angles, so that’s something. and I’ve shown some congruent angles. No line segment lengths are given, so let’s use symbols: define , the last coming from the fact triangles ADG and FHG have to be congruent. Define . What we have to find is the difference between the blue area, which is , and the green area, which is . But and are congruent, so we can cross them off and we just need . is similar to , and , so . The area of is . 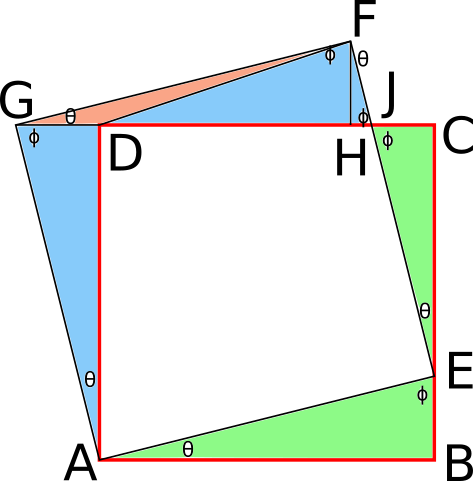 is , so the area of triangle is . so the area of triangle is . Then the area of triangle is . Independent of ! Mysteriously. I wish I could find a clever way to see that. Anyway, the area of triangle is . Mysteriously the same as ! 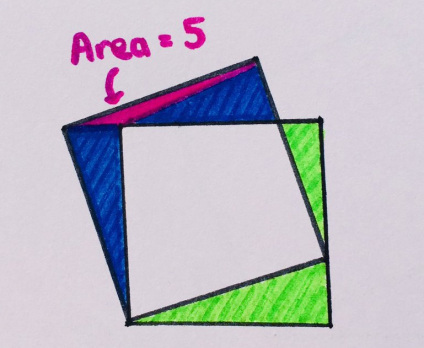 So the answer is, the blue area is larger by 5.